Certainly one of the most flamboyant New Orleans pianists in recent memory, James Carroll Booker III was a major influence on the local rhythm & blues scene in the '50s and '60s. Booker's training included classical instruction until age 12, at which time he had already begun to gain recognition as a blues and gospel organist on radio station WMRY every Sunday. By the time he was out of high school, he had recorded on several occasions, including work for his first release, "Doing the Hambone," in 1953. In 1960, he made the national charts with "Gonzo," an organ instrumental, and over the course of the next two decades played and recorded with artists as varied as Lloyd Price, Aretha Franklin, Ringo Starr, the Doobie Brothers, and B.B. King. In 1967, he was convicted of possession of heroin and served a one-year sentence at Angola Penitentiary (referred to as the "Ponderosa"), which took the momentum out of an otherwise promising career. 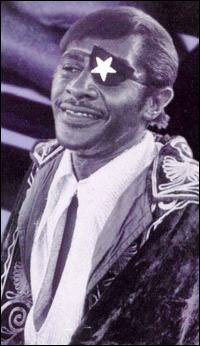 The rediscovery of "roots" music by college students during the '70s, focusing primarily on Professor Longhair ("Fess"), provided the opportunity for a comeback by 1974, with numerous engagements at local clubs like Tipitina's, The Maple Leaf, and Snug Harbor. As with "Fess," Booker's performances at the New Orleans Jazz & Heritage Festivals took on the trappings of legendary "happenings." He often spent his festival earnings to arrive in style, pulling up to the stage in a rented Rolls Royce and attired in costumes befitting the "Piano Prince of New Orleans," complete with a cape. Such performances tended to be unpredictable; he might easily plant some Chopin into a blues tune or launch into a tirade about the CIA with all the fervor of a "Reverend Ike-meets-Moms Mabley" tag-team match. Booker's left hand was simply phenomenal, often a problem for bass players who found themselves running for cover in an attempt to stay out of the way. With it, he successfully amalgamated the jazz and rhythm & blues idioms of New Orleans, adding more than a touch of gospel for good measure. His playing was also highly improvisational, reinventing a progression (usually his own) so that a single piece would evolve into a medley of itself. In addition, he had a plaintive and searing vocal style which was equally comfortable with gospel, jazz standards, blues, and popular songs. Despite his personal eccentricities, Booker had the respect of New Orleans' best musicians, and elements of his influence are still very much apparent in the playing of pianists like Henry Butler and Harry Connick Jr.